Aqueous base prepared and allowed to cool. Then, the fats were melted and everything mixed around 120F. Mixed with an immersion blender and when the mixture thickened, I poured into two disc-shaped molds lined with plastic wrap and covered the surface with additional plastic wrap. I intend to slice these into 4 semi-circle bars. The critical factor to this soap is according to the recipe, I should have only added 68 g NaOH, but according to the MMS calculator, it should be 75 grams for a superfatted soap. We'll see how it turns out. It traced kind of quick. This recipe size was perfect to fill 2 x 400 mL molds (enough for 4 good sized bars). 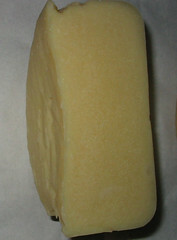 Soap was popped out of their molds after about 12 hours, very firm and cut to shape and allowed to cure in air. No visible carbonate on the surface. I think the MMS Calculator is pretty good in getting the right amount of NaOH in the mixture. One day after unmolding, and cutting into bars there's no trace of carbonate formation. Years ago, when I made soap, I had problems with carbonate formation on the exterior surface of the bars. These are really clean and already very firm. I suspect they'll be ready to use within a couple weeks. So, get ready readers, some of you just might be reading about the development of your xmas gift. Sorry to ruin the surprise.